One of the more beautiful, unusual and useful map projections ever devised was created by cartographer Bernard Cahill. The butterfly projection was first published in the Scottish Geographical Magazine in 1909. Cahill (1866-1944) later applied for a US patent to protect his creation. 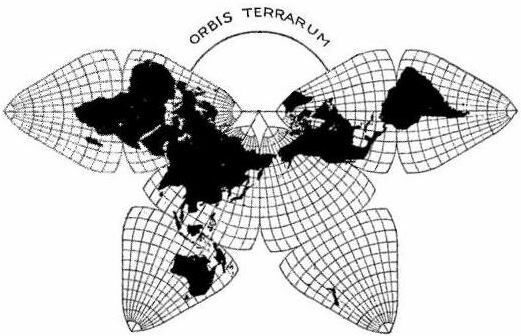 Cahill’s butterfly map, like Buckminster Fuller’s later Dymaxion Maps (1943 and 1954) enabled all the continents to appear linked, and with reasonable fidelity to a globe. Cahill demonstrated this principle by also inventing a rubber ball globe which could be placed under a pane of glass and flattened into the “Butterfly” form. When removed, the map/globe reverted to its original shape. Largely in honor of his cartographic innovation, Cahill was elected a Fellow of the Royal Geographical Society. In 1913 he started the Cahill World Map Company, but this company was not successful and his map has since been largely forgotten by most people. But not by cartographer Gene Keyes! Except for Cahill himself, no follower of Cahill’s projection has ever been as dedicated as Gene Keyes, a former student of Buckminster Fuller. Keyes’ website is a mine of information about Cahill and his map projection, and is well worth reading. Born in the UK, Bernard Joseph Stanislaus Cahill (18661944) was an architect, town planner and cartographer who moved to San Francisco, California, in 1888. He was an early proponent of the San Francisco Civic Center and designed that city’s Neptune Society Columbarium. Cahill encountered some stiff obstacles in the many years it took him to develop his butterfly projection. For example, he lost all his initial drawings and papers in the disastrous San Francisco earthquake and fire of 1906. At least one major publisher signed a contract to publish the butterfly map as a wall map and in an atlas, but then failed to follow through. Soon after its creation, Cahill’s butterfly map was used to illustrate a flying trip around the world, or circumaviation, proposed for the Panama Pacific International Exposition held in San Francisco in 1915. The map was exhibited at this exposition and won a gold medal for cartography. Some time later, the map was used by both the State of California and the City of Charleston to illustrate shipping routes. In 1924, the American Express Company chose the map for use during a world tour aboard the Cunard ocean liner Laconia. According to Keyes, the map was prominently displayed on the Palm Deck of the ship and seen by Robert Ripley, a participant on the world tour, who later featured it in his Believe it or Not series. Perhaps the closest Cahill came to seeing his map in more general use came in 1937, when the International Meteorological Committee apparently came within a single vote of adopting a version of his projection for all world weather charting. Keyes goes on to note that, “Cahill was not merely an astute architect and cartographer, but, that like Fuller, his map expressed an underlying whole-earth philosophy much like themes which emerged 60 years later. Cahill used the term “geosophy” in that regard….” (And used it as early as 1912, well before the geographer J.K. Wright, commonly credited for having coined the term in 1947). Will Cahill’s map ever catch on? The latest sign of renewed interest in Cahill’s projection comes from its adaptation by the New York Times as the basis for a series of 10 maps published in December 2011 illustrating the changing world of computing, communications and technology. 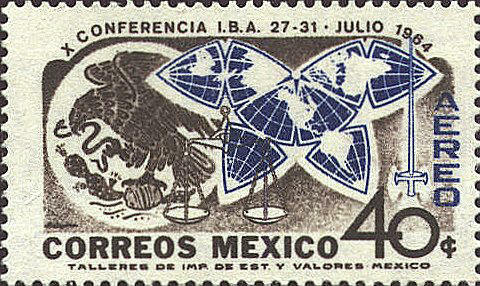 Sadly, that has proved to be all too true, despite its inclusion in the design of a Mexican postage stamp. Like always a very pretty and interesting article, but the link to NY Times and their “series of 10 maps” doesnt work. Apologies for that error, caused by a misplaced “dash” in the code. Clearly, we need to improve our final checking system!